A good idea with a great presentation that doesn't achieves its full potential due to it's low budget limitations. Without considering its aim, RIOT may seem just a poor RTS. However, its ability to integrate gameplay's limits in a dialogue between them and the game's thesis made RIOT a really experimental and interesting game, unique in its own approach to the genre. Riot: Civil Unrest attempts to depict complex socio-political upheavals in an extremely unengaging and unintuitive manner, to the point that these events lose their impact in video game form. RIOT - Civil Unrest could have been something special, but its move to Nintendo Switch from other platforms hasn't seen that potential embraced any further. The lack of touchscreen support and the absence of a proper tutorial mode are odd decisions considering how difficult it can be to follow the action when playing in handheld/tabletop mode. Even its use of real-life clashes between protesters and police fails to bring anything insightful or interesting to the table. Sadly, this riot is already fizzling out. RIOT - Civil Unrest pits the player in the midst of scenes of violent urban confrontations based on real life events and is worthy of praise for introducing such an unusual premise. When it comes to execution, though, RIOT is less likely to impress, especially when it comes to its control system and to problems when assessing the most relevant elements on the screen. The promise of future updates can sort out some of the game's flaws but until then, this is a title that's very difficult to recommend. RIOT: Civil Unrest is a protest simulator, between the NO TAV movement, Indignados e Tahrir square, but it is also a very poor RTS. Riot - Civil Unrest portrays a political firestorm based on personal experience. It challenges players to make tough choices in hard times, ushering in uncontrolled anarchy despite its shallow gameplay. 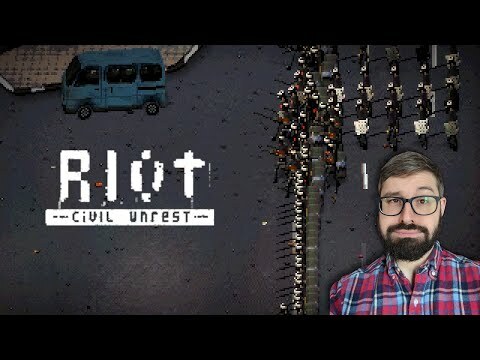 Riot: Civil Unrest has the look and feel a good RTS with entertaining yet challenging gameplay sections, but it all feels a bit weird when considering a) these sections are based on real events, and b) that the gameplay is fun and entertaining, but really only when you play as the protesters. Acceptable game with strong theme and decent gameplay. Will you join police or rebels? It’s grim and effective in that regard, but its gameplay really lets it down. RIOT – Civil Unrest‘s captivating art style and audio design is worth paying a visit to, and the game has some great ideas, but poor UI design, buggy AI and gameplay glitches really dampen the experience. I won’t lie, I feel really let down by Riot: Civil Unrest. I felt like a kid at Christmas who was excitedly looking forward to opening a present under the tree to realise it was a potato and not what I had wished for. On the face value of it, I was intrigued by the concept and what I was going to discover, however, the way the game has been designed and drawn lets it down majorly. With polished graphics, better sound and a tutorial that helps you understand what the hell you are doing, this game could have had so much potential. For me, it is currently being deleted from my console. Harsh I know, but it is for the best. RIOT: Civil Unrest seeks to share both sides of global events of upheaval. While it is presented in masterfully crafter low fidelity pixel art, the controls on the Nintendo Switch are simply lacking in the care and finesse the rest of the game shows. If you are going to check it out, we would highly recommend the PC platform over the Switch. Riot: Civil Unrest is for me, apart from the idea, an innovative and novel game. Unfortunately it's too chaotic, incomprehensible and playful not rich in content. Maybe this realistic scenario is not meant for a game. It’s a shame, as we complain we never get anything new to play. But something as too abstract as this chaotic affair doesn’t hit any specific mark to make it fun. I’d recommend if you want to try something a bit out there, or perhaps enjoy your interactive history lessons. Do not get this game. You will regret the purchase near instantly. The game is broken, unpolished, cluttered, and just not fun. RIOT: Civil Unrest will inevitably be a free game of the month at some point. Pick it up then if you want, try it and let me know if you runs the same for you. But other than that, I just wouldn’t touch this game. If you found a small, gold nugget in here, or you just want to see if it’s as bad as I say, then feel free to pick it up. But be warned. This game made me want to throw a riot in frustration. Riot: Civil Unrest ends up being a classic case of a great idea, but lackluster execution. The game isn't fun or exciting to play, and honestly doesn't really feel like a game. Making a game about civil unrest was a difficult task, one that a small team from Italy seems unprepared to have tackled. Their final product feels incomplete, with buggy and slowly-paced gameplay and a brief story lacking cohesion. Frankly, Riot communicates nothing of importance about the conflicts it bases itself on and can barely support itself as a strategy game. I don't predict a riot, but I do predict giving this title a miss.